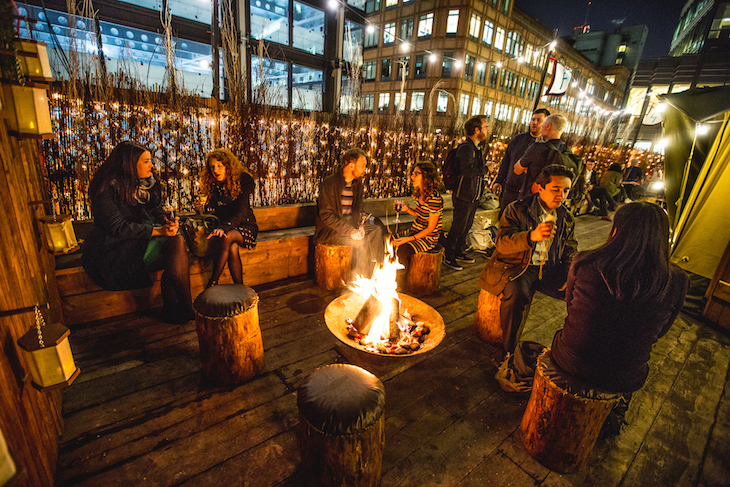 Summer in London sees a stampede of rooftop bars opening, and winter brings its own festive bars. But plenty of places have rooftop bars open all year; booze with views... but no pop-up crowds. Note: some are at the pricier end of the scale or require booking, and some have dress codes. It's also worth checking opening hours before you go, as they may occasionally be closed for private events. 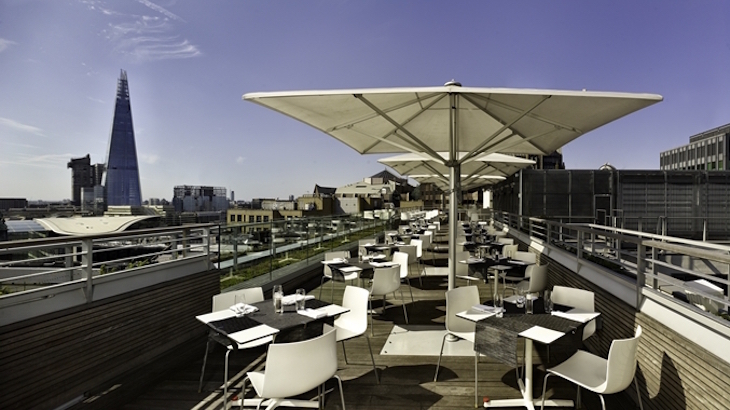 All three Harvey Nichols venues on the eighth floor of the Oxo Tower (the restaurant, the bar, and the brasserie) have their own terrace with views across the Thames. They all open year round, weather dependent. Check the forecast before you make your way up there. 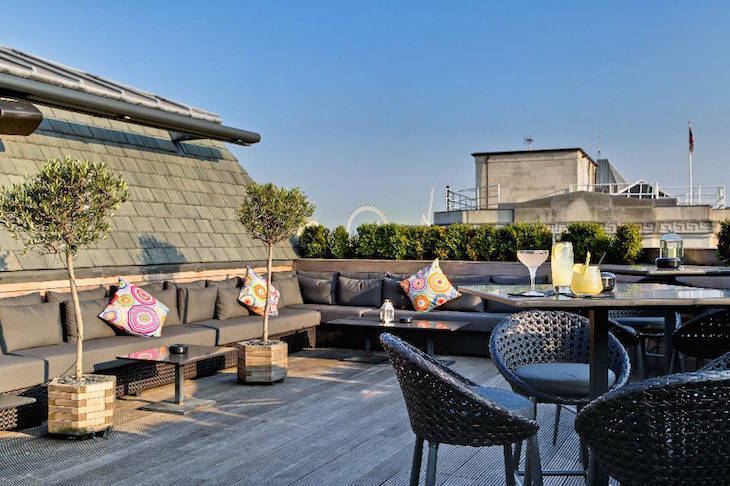 Of all the bars on this list, Radio Rooftop offers some of the best London views — and it's no surprise, with its central location 10 floors above Strand, right opposite Somerset House. Take an express lift from the hotel reception and get started on the themed cocktail menu (Mile High Margarita, anyone?). Comfy chairs and patio furniture make the terrace very in-demand in the summer months — why not make the most of the heaters in winter instead. This one's not in the Tower itself, unfortunately, but it's not far off, situated on the 12th floor of the DoubleTree by Hilton hotel. It's actually two terraces, giving you views in pretty much any direction you like. A lot of the venues on this list offer excellent views of London's most famous landmarks, but at this one, you're practically rubbing noses with St Paul's Cathedral. 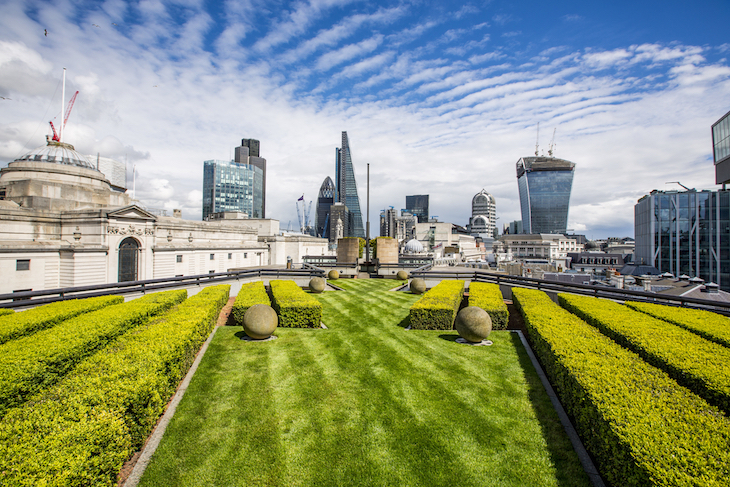 It's located on the roof of One New Change shopping centre, just across the road from Wren's masterpiece. 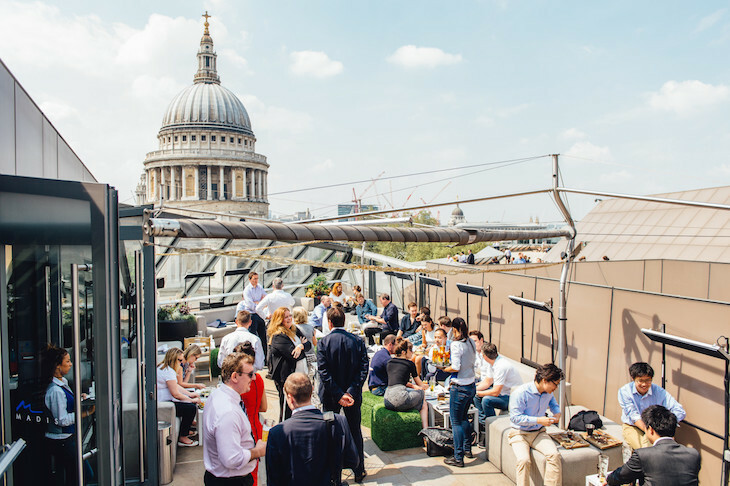 You can visit the rooftop for free during shopping centre opening hours, but it's worth kicking back with a cocktail and some bar snacks and enjoying the full effect. Lunch is served on this Regent Street terrace noon-2.30pm, but after that, it's open for drinks on a no-reservations basis. It's quite the sun trap on balmy days, and affords a fine view of Oxford Street and the West End. It's part of Aqua Kyoto, a high-end restaurant, and the crowd is suitably suited and booted. Suit and boots are, however, optional. The Driver is a venue of many levels; the first floor gastro pub and second floor bar give way to the saloon and penthouse before finally reaching the heady heights of the roof terrace. Grab yourself a drink and get comfy on a sofa — or hire the whole terrace for a barbecue. This one's more of a restaurant than a bar, but if you're looking for sky-high Michelin-starred food, head to South Place Hotel, situated between Liverpool Street and Moorgate. Over lunch, it's an extension to the seafood restaurant, but cocktails and light snacks rule in the evening. Come winter, it's fitted with that holiest of all grails, a retractable roof and heaters. 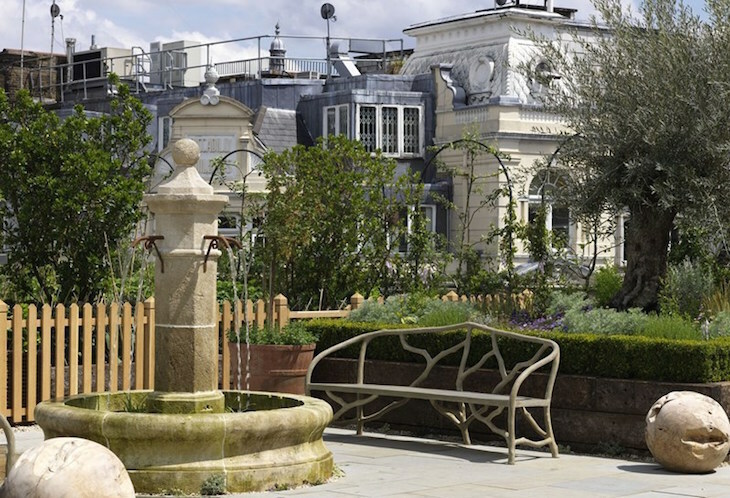 We're seriously lamenting the fact that Ham Yard Hotel's roof terrace is only open to hotel guests or under private hire, as it looks gorgeous. 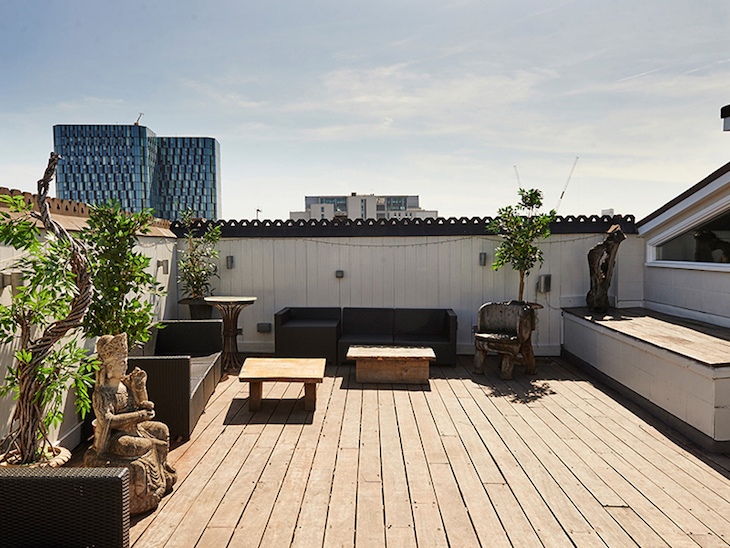 As well as some rather comfy looking sofas, the rooftop is home to a kitchen garden and even some rooftop beehives. 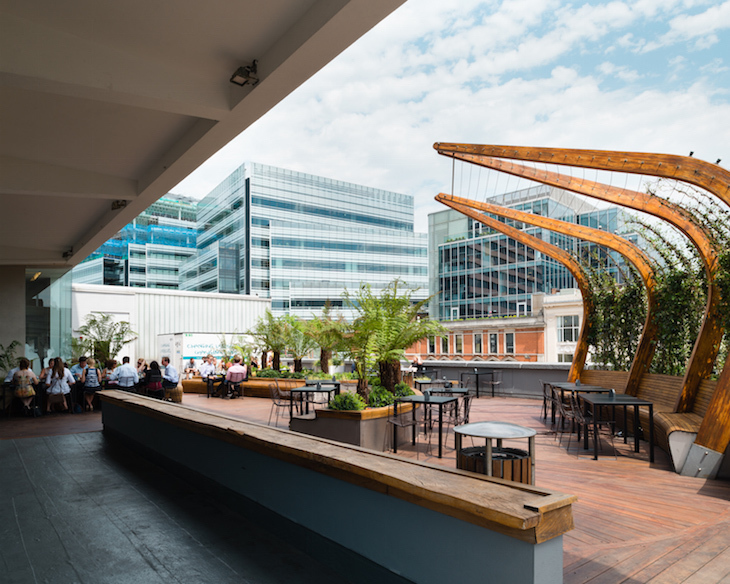 On top of Bank's Bagpuss building, the heated terraces of Coq d'Argent function as an extension to the grill restaurant by day, reservation only. By night, you can do away with the reservations and bar snacks are available to soak up the wine and cocktails. 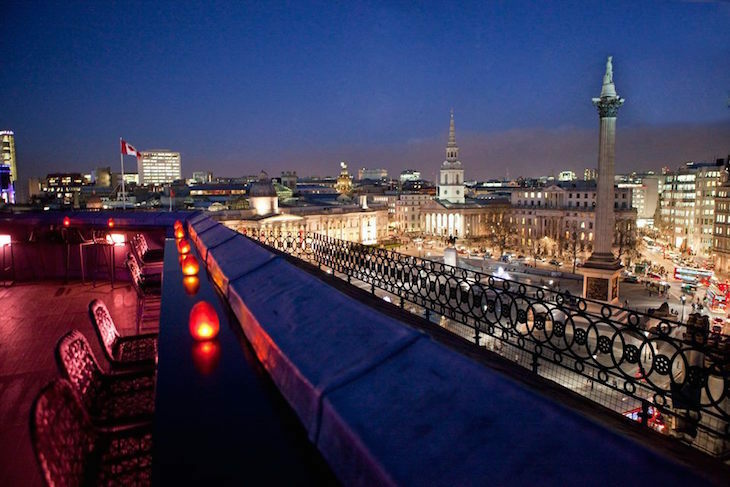 This open air rooftop bar overlooking Trafalgar Square stays open throughout the winter with a special menu featuring all manner of mulling. In summer, it's a lovely (if often busy) place to go and look down on the unsuspecting tourists below. Next time you walk pass Albion cafe in Shoreditch, look up. There's a terrace up there, complete with heated rooftop orangery — part of the Boundary bar and grill. Lemons and clementines are among the fruits being grown. While the outside area is mainly reserved for drinks — including warm cocktails in the winter — you can also order from the grill menu. Tuck into seafood during summer or a warming winter raclette while taking in the east London skyline. 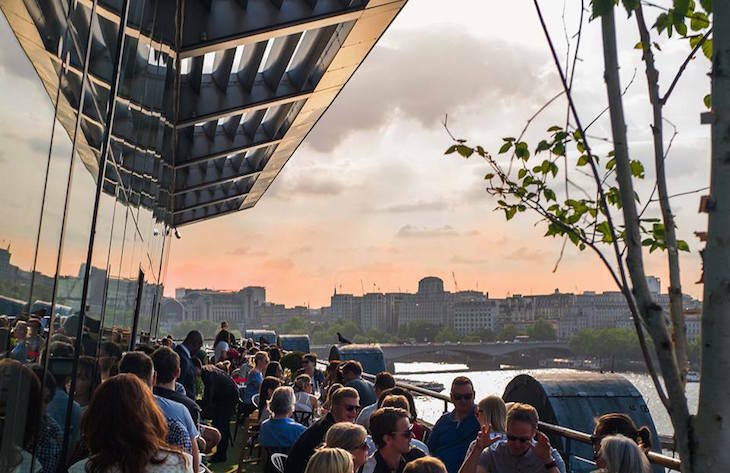 A lot livelier than some of the other venues on this list, Big Chill House is a bar serving food, with a roof terrace, and parties until 3am every Friday and Saturday night. The cocktail list here isn't extensive — focus is very much on craft beers, many produced in London. As a result, it's not as pricey as some of London's more upmarket roof hangouts. Keeping the west London crowd rooftop dwelling is this lovely local theatre, says Londonist's Ruth Hargreaves. 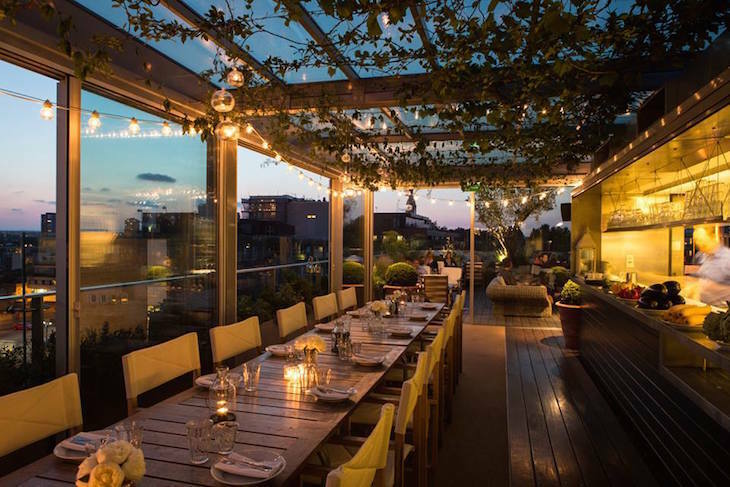 The charming roof garden is part of Lyric Bar and Grill which serves salads and soups during the day, plus a bunch of grilled goods and sharing platters of an evening. Whether you're catching a show or not, it's a marvellous spot and areas of it can be hired for special occasions too. 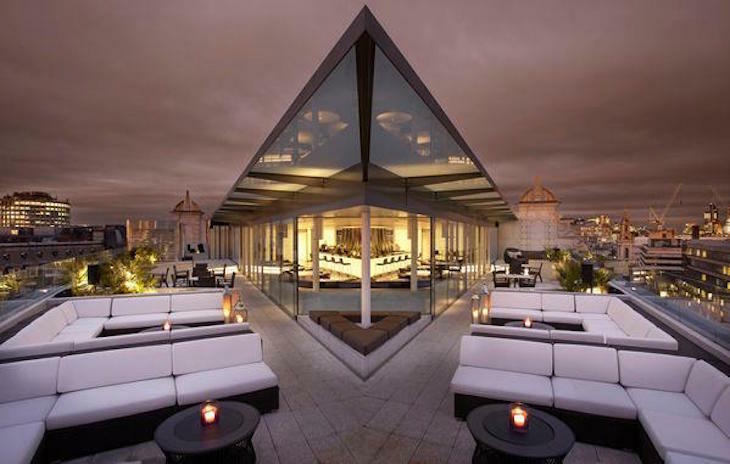 Two themed offerings, in summer and winter, render Queen of Hoxton's rooftop bar open for most of the year. Its warm weather offering usually runs from April-October, when it closes briefly before reopening in its winter transformation. Check website for current details.